As a happy owner of the Nintendo Entertainment System growing up, I know all too well the frustration when the NES wouldn't recognize my game cartridges. My trick, learned from friends, was to blow the cartridge connectors with all my might. It always worked... eventually. 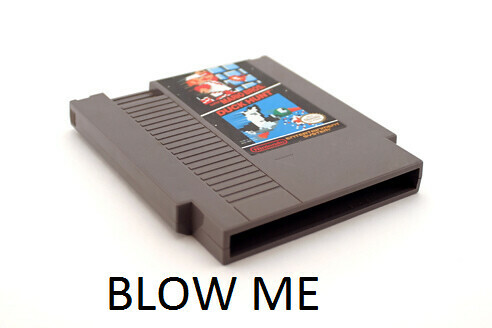 I spent years blowing my Nintendo cartridges and always assumed that's how I got the game to load. Then, earlier this year, I learned the horrible truth. Blowing my Nintendo game cartridges did absolutely nothing. In fact, Nintendo claims the moisture from my breath helped ruin the games. I often wondered if this was true or not. I must say though....it seemed to work. Everybody I know who had this game system did the same thing and it worked. It worked for me. Apparently, not blowing and just trying again would have had the same effect. It was a hardware design flaw and our blowing was just a placebo. I find it interesting that no matter where you were from, everyone seemed to know the 'blowing' trick. I did not grow up in Toronto, or Ontario for that matter yet everyone knew to blow. Maybe not for NES but it worked for my Atari. I remember on NES pushing the "reset" button (or whatever) over and over, got results. .......I wonder if it was like banging on the side of the old Black and White to try and make the picture better? I still play Nintendo 64 & frequently the games don't start in the console. I do blow the diodes & then they work every time. Wayne Gretzky used to put baby powder on his hockey stick blade...worked for him! As an avid gamer, I have a lot of cartridges to blow. But I feel such manual labour is beneath me. So I offshored my blowing to Greece. You can hire on the cheap, thanks to a skyrocketing unemployment rate. I currently have Poseidon blowing my cartridges. Whenever I fire up my NES, he raises a mighty wind to rival mortal and gods alike. Sure, there's the occasional devastated coastal village, but when I need my Mario fix, no price is too high. I also used to have Persephone bringing me gamer snacks, but I haven't seen the lazy woman in months. I think she might be visiting family down south or something. @Lorne: Couldn't help but laugh.